Deer Ridge inmates take on the roles of the jury in a homicide trial for the public production. 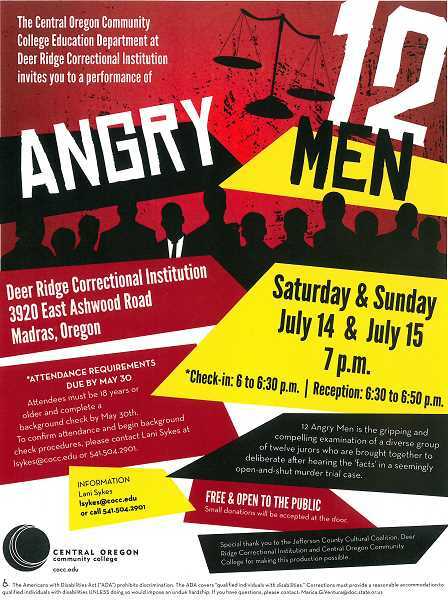 The Central Oregon Community College Education Department at Deer Ridge Correctional Institution invites the public to enjoy a performance of "12 Angry Men." The drama, written in 1954, is about the deliberations of a jury in a homicide trial. Inmates will give two performances, Saturday and Sunday, July 14 and 15, at the prison at 3920 East Ashwood Road, Madras. Although curtain time for each of the performances is set for 7 p.m., attendees must arrive between 6 and 6:30 p.m. in order to be processed to be permitted to enter. From 6:30-6:50 p.m., there will be a cookie reception and music. There is no cost for the performances, but small donations will be accepted at the door. Donations will go toward future theatrical productions at Deer Ridge. The production is offered thanks to the Jefferson County Cultural Coalition, Deer Ridge Correctional Institution, and Central Oregon Community College.